The culture of Somalia is an amalgamation of traditions in that were developed independently since the proto-Somali era through interaction with neighboring and far away civilizations, including other parts of Africa, the Arabian Peninsula, and Indian subcontinent. The hypernym of the term Somali from a geopolitical sense is Horner and from a ethnic sense, it is Cushite. 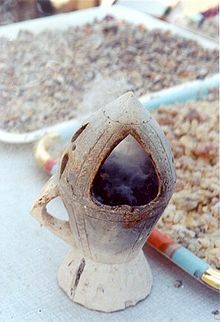 A traditional dabqaad incense burner. The cultural diffusion of Somali commercial enterprise can be detected in its exotic cuisine, which contains Southeast Asian influences. Due to the Somali people's passionate love for and facility with poetry, Somalia has often been referred to as a "Nation of Poets" and a "Nation of Bards", as, for example, by the Canadian novelist Margaret Laurence. Somalis have a story-telling tradition. Somalis have a rich musical heritage centered on traditional Somali folklore. Most Somali songs are pentatonic; that is, they only use five pitches per octave in contrast to a heptatonic (seven note) scale such as the major scale. Somali art is the artistic culture of the Somali people, both historic and contemporary. These include artistic traditions in pottery, music, architecture, wood carving and other genres. Somali art is characterized by its aniconism, partly as a result of the vestigial influence of the pre-Islamic mythology of the Somalis coupled with their ubiquitous Muslim beliefs. The country's shape gives a united country the nickname toddobo (seven). Somali nationalism is centered on the notion that Somalis in Greater Somalia share a common language, religion, culture and ethnicity, and as such constitute a nation unto themselves. The ideology's earliest manifestations are often traced back to the resistance movement led by Mohamed Abdullah Hassan's Dervish revolt at the turn of the 20th century. In northwestern present-day Somalia, the first Somali nationalist political organization to be formed was the Somali National League (SNL), established in 1935 in the former British Somaliland protectorate. In the country's northeastern, central and southern regions, the similarly-oriented Somali Youth Club (SYC) was founded in 1943 in Italian Somaliland, just prior to the trusteeship period. The SYC was later renamed the Somali Youth League (SYL) in 1947. It became the most influential political party in the early years of post-independence Somalia. Former leader of the Somali Youth League Aden Abdullah Osman Daar who eventually became the first President of the Somali Republic following the union of State of Somaliland and Italian Trusteeship of Somalia. Mohammed Abdullah Hassan (7 April 1856 – 21 December 1920) – Somali nationalist and religious leader that established the Dervish movement during the Scramble for Africa. Haji Sudi - One of the founding members of the Dervish movement and Second in command after Mohamed Abdullah Hassan. Mohamoud Ali Shire – 26th Sultan of the Warsangali Sultanate (1897–1960). Hasna Doreh – Early 20th century Somali female commander of the Dervish movement that frequently joined battles against the imperial powers during the Scramble for Africa. Hawo Tako (d.1948) – Early 20th century Somali female nationalist whose sacrifice became a symbol for Pan-Somalism. Bashir Yussuf (b. 1905–1945) – Somali nationalist and religious leader. Abdullahi Issa (b. 1922–1988) – First Prime Minister of Somalia. Aden Abdullah Osman Daar (7 January 1960 – 10 June 1967) – First President of Somalia. Abdirashid Ali Shermarke (10 June 1967 – 15 October 1969) – Second President of Somalia. Hirsi Bulhan Farah – Former Minister in the civilian government of the 1960s, political prisoner and Pan-Somalist. Siad Barre (b. 1919 – 2 January 1995) – Third President of Somalia. Jama Korshel – Somali National Army General, former Head of Somali Police, and commander in the Supreme Revolutionary Council. Daud Abdulle Hirsi (1925–1965) – Prominent Somali General considered the Father of the Somali Military. Mahmoud Harbi – active Pan-Somalist that came close to uniting Djibouti with Somalia in the 1970s. Salaad Gabeyre Kediye – Major General in the Somali military and a revolutionary. Abdirizak Haji Hussein – Former Prime Minister of Somalia (1964–1967) and Somali Youth League leader. Sheikh Mukhtar Mohamed Hussein, speaker of parliament, from 1965 to 1969 and interim President of Somalia before the coup d'état in 1969. Abdullahi Ahmed Irro – General in the Somali National Army; established the National Academy for Strategy. Ali Matan Hashi – Brigadier General and politician; first Somali Air Force pilot, the father of Somali Air Force and a prominent member of the Supreme Revolutionary Council. Abdirahman Jama Barre – Former Minister of Foreign Affairs and Minister of Finance of Somalia. Haji Bashir Ismail Yusuf – First President of the Somali National Assembly and prominent Somali Youth League member. Osman Haji Mohamed – Prominent Somali Youth League member and parliamentarian. Abdullahi Yusuf Ahmed – President of Somalia, Colonel in Somali National Army, and commander during WSLF campaign. Omar Osman Rabeh – Pan-Somalist that has written many works on Somali nationalism. Mohamed Farah Aidid – Prominent Somali military commander and political leader. A former general and diplomat, he was the chairman of the United Somali Congress (USC) and later led the Somali National Alliance (SNA). In 1992, Aidid attacked American troops in the nation. He was one of the main targets of the Unified Task Force. Eventually forcing United States forces to withdraw from Somalia in 1995. With very few exceptions, Somalis are entirely Muslims, the majority belonging to the Sunni branch of Islam and the Shafi‘i school of Islamic jurisprudence. Merca is an ancient Islamic center in Somalia. There are two theories about when Somalis began adopting Islam. One states that Islam probably arrived in Somalia in the 7th-century when followers of Muhammad came over to escape persecution from the Quraysh tribe in Mecca. An alternate theory states that Islam was brought to the coastal settlements of Somalia between the 7th- and the 10th-century by seafaring Arab and Persian merchants. The Sunni-Shia split within Islam occurred before Islam spread among Somalis, and Sunnis constitute the overwhelming majority of contemporary Somalis. Somali Sufi religious orders (tariqa) – the Qaadiriya, the Ahmadiya and the Saalihiya – in the form of Muslim brotherhoods have played a major role in Somali Islam and the modern era history of Somalia. Of the three orders, the less strict Qaadiriya tariqa is the oldest, and it is the sect to which most Somalis belonged. The Qaadiriya order is named after Shaikh Muhiuddin Abdul Qadir Gilani of Baghdad. I. M. Lewis states that Qaadiriya has a high reputation for maintaining a higher standard of Islamic instruction than its rivals. Ahmadiyah and its sub-sect Salihiyyah preached a puritanical form of Islam, and have rejected the popular sufi practice of tawassul (visiting the tombs of saints to ask mediation). B. G. Martin states that these two orders shared some of the views of the Wahhabis of Arabia. The religious differences between Qaadiriya and Salihiyya were controversial, as Salihis continued to oppose the Qadiris' practice of tawassul, and claimed the act to be invalid and improper religious activity. The Ahmadiya has the smallest number of adherents of the three orders. Qur'anic schools (also known as dugsi) remain the basic system of traditional religious instruction in Somalia. It is delivered in Arabic. They provide Islamic education for children. According to the UNICEF, the dugsi system where the content is based on Quran, teaches the greatest number of students and enjoys high parental support, is oftentimes the only system accessible to Somalis in nomadic as compared to urban areas. A study from 1993 found, among other things, that "unlike in primary schools where gender disparity is enormous, around 40 per cent of Qur'anic school pupils are girls; but the teaching staff have minimum or no qualification necessary to ensure intellectual development of children." To address these concerns, the Somali government on its own part subsequently established the Ministry of Endowment and Islamic Affairs, under which Qur'anic education is now regulated. Somali community has produced important Muslim figures over the centuries, many of whom have significantly shaped the course of Islamic learning and practice in the Horn of Africa and the Muslim world. Although Somali women were initially excluded from the many male-dominated religious orders, the all-female institution Abay Siti was formed in the late 19th century, incorporating Somali tradition and Islam. Sheikh Ali Ayanle Samatar, a prominent Somali Islamic scholar. Abdirahman bin Isma'il al-Jabarti – 10th century Islamic leader in northern Somalia. Sheikh Isaaq Bin Ahmed Al Hashimi – 12th century Islamic leader in the northwestern Somalia area. Yusuf bin Ahmad al-Kawneyn – 13th century scholar, philosopher and saint. Associated with the development of Wadaad writing. Abadir Umar ar-Rida – 13th century Sheikh and patron saint of Harar. Uthman bin Ali Zayla'i – 14th century Somali theologian and jurist who wrote the single most authoritative text on the Hanafi school of Islam, consisting of four volumes known as the Tabayin al-Haqa’iq li Sharh Kanz al-Daqa’iq. Sa'id of Mogadishu – 14th century Somali scholar and traveler. His reputation as a scholar earned him audiences with the Emirs of Mecca and Medina. He travelled across the Muslim world and visited Bengal and China. Ahmad ibn Ibrahim al-Ghazi (c. 1507 – 21 February 1543) – 16th century Imam and military leader that led the Conquest of Abyssinia. Nur ibn Mujahid – 16th century Somali Emir and patron saint of Harar. Ali al-Jabarti (d. 1492) – 16th century Somali scholar and politician in the Mamluk Empire. Hassan al-Jabarti (d. 1774) – Somali mathematician, theologian, astronomer and philosopher; considered one of the great scholars of the 18th century. Abd al-Rahman al-Jabarti (1753–1825) – Somali scholar living in Cairo that recorded the Napoleonic invasion of Egypt. Abd al Aziz al-Amawi (1832–1896) – 19th century influential Somali diplomat, historian, poet, jurist and scholar living in the Sultanate of Zanzibar. Shaykh Abd Al-Rahman bin Ahmad al-Zayla'i (1820–1882) – Somali scholar who played a crucial role in the spread of the Qadiriyyah movement in Somalia and East Africa. Shaykh Sufi (1829–1904) – 19th century Somali scholar, poet, reformist and astrologer. Sheikh Uways Al-Barawi (1847–1909) – Somali scholar credited reviving Islam in 19th century East Africa and with followers in Yemen and Indonesia. Abdallah al-Qutbi (1879–1952) – Somali polemicist theologian and philosopher; best known for his five-part Al-Majmu'at al-mubaraka ("The Blessed Collection"), published in Cairo. Sheikh Muhammad al-Sumali (1910-2005) – Somali scholar and teacher in the Masjid Al-Haram in Mecca. He influenced many of the prominent Islamic scholars of today. The Somali language is the official language of Somalia. It is a member of the Cushitic branch of the Afro-Asiatic language family, and its nearest relatives are the Afar and Oromo languages. Somali is the best documented of the Cushitic languages, with academic studies of it dating from before 1900. Somali dialects are divided into three main groups: Northern, Benaadir and Maay. Northern Somali (or Northern-Central Somali) forms the basis for Standard Somali. Benaadir (also known as Coastal Somali) is spoken on the Benadir coast from Adale to south of Merca, including Mogadishu, as well as in the immediate hinterland. The coastal dialects have additional phonemes which do not exist in Standard Somali. Maay is principally spoken by the Digil and Mirifle (Rahanweyn) clans in the southern areas of Somalia. The script was developed by the Somali linguist Shire Jama Ahmed specifically for the Somali language, and uses all letters of the English Latin alphabet except p, v and z. Besides Ahmed's Latin script, other orthographies that have been used for centuries for writing Somali include the long-established Arabic script and Wadaad's writing. Indigenous writing systems developed in the twentieth century include the Osmanya, Borama and Kaddare scripts, which were invented by Osman Yusuf Kenadid, Sheikh Abdurahman Sheikh Nuur and Hussein Sheikh Ahmed Kaddare, respectively. In addition to Somali, Arabic is an official national language of Somalia. Many Somalis speak it due to centuries-old ties with the Arab World, the far-reaching influence of the Arabic media, and religious education. English is also widely used and taught. Italian used to be a major language, but its influence significantly diminished following independence. It is now most frequently heard among older generations who were in contact with the Italians at that time or later as migrants into Italy. Other minority languages include Bravanese, a variant of the Bantu Swahili language that is spoken along the coast by the Bravanese people. The clan groupings of the Somali people are important social units, and clan membership plays a central part in Somali culture and politics. Clans are patrilineal and are divided into sub-clans and sub-sub-clans, resulting in extended families. When not dressed in Westernized clothing such as jeans and t-shirts, Somali men typically wear the macawis (ma'awiis), which is a sarong-like garment worn around the waist and a large cloth wrapped around the upper part of their body. On their heads, they often wrap a colorful turban or wear the koofiyad, an embroidered taqiyah. Due to Somalia's proximity to and close ties with the Muslim world, many Somali men also wear the Thawb (khamiis in Somali), a long white garment common among Muslims. 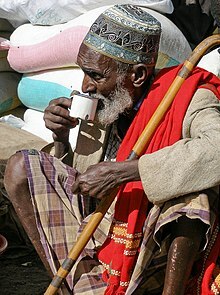 Traditionally Somali attire for men consisted of two sheets(often plain white), one draped over the shoulder and the other tied around the waist. The sheet sometimes had embroidery, patterns or laced borders. This attire is no longer common though it can be found in some rural communities. During regular, day-to-day activities, women usually wear the guntiino, a long stretch of cloth tied over the shoulder and draped around the waist. The guntiino is traditionally made out of plain white fabric sometimes featuring with decorative borders, although nowadays alindi, a textile common in the Horn region and some parts of North Africa, is more frequently used. The garment can be worn in many different styles and with different fabrics. For more formal settings such as weddings or religious celebrations like Eid, women wear the dirac, a long, light, diaphanous voile dress made of cotton or polyester fabric. It is worn over a full-length half-slip and a brassiere. Known as the gorgorad, the underskirt is made out of silk and serves as a key part of the overall outfit. The dirac is usually sparkly and very colorful, the most popular styles being those with gilded borders or threads. The fabric is typically acquired from Somali clothing stores in tandem with the gorgorad. In more informal settings, like being at home, Somali women typically wear baati. A baati is a long dress-like wear that is made out of comfortable polyester. Married women tend to sport head-scarves referred to as shash, and also often cover their upper body with a shawl known as garbasaar. A garbasaar can be worn by any woman regardless of their martial status. In general, however, Somali women cover up with Hijab when outside their home or in the presence of men outside of the immediate family (cousins, uncles, friends). Additionally, Somali women have a long tradition of wearing gold and silver jewelry, particularly bangles. During weddings, the bride is frequently adorned in gold. Many Somali women by tradition also wear gold necklaces and anklets. The xirsi, an Islamic necklace likewise donned in Ethiopia and Yemen, is frequently worn. Somali singer Fartuun Birimo wearing henna hand and arm designs. Additionally, henna is an important part of Somali culture. It is worn by Somali women on their hands, arms, feet and neck during weddings, Eid, Ramadan, and other festive occasions. Somali henna designs are similar to other horn of Africans, often featuring flower motifs and triangular shapes. The palm is also frequently decorated with a dot of henna, and the fingertips are dipped in the dye. Henna parties are usually held before the wedding ceremony takes place. Somali woman in Hargeisa opening speech with traditional greeting. During the Siad Barre era, a new greeting intended to combat the prevalence of clannism was introduced called jaale, which in Somali has dual meanings, including the color yellow and comrade or friend. Somali scholars have for centuries produced many notable examples of Islamic literature ranging from poetry to Hadith. 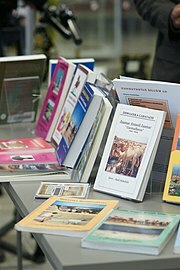 With the adoption of the Latin alphabet in 1972 to transcribe the Somali language, numerous contemporary Somali authors have also released novels, some of which have gone on to receive worldwide acclaim. Of these modern writers, Nuruddin Farah is probably the most celebrated. Books such as From a Crooked Rib and Links are considered important literary achievements, works which have earned Farah, among other accolades, the 1998 Neustadt International Prize for Literature. Farah Mohamed Jama Awl is another prominent Somali writer who is perhaps best known for his Dervish era novel, Ignorance is the enemy of love. Mohamed Ibrahim Warsame is considered by many to be the greatest living Somali poet, and several of his works have been translated internationally. Basketball is also played in the country. The FIBA Africa Championship 1981 was hosted in Mogadishu from December 15 to December 23, 1981, during which the national basketball team received the bronze medal. Abdi Bile was the first athlete from Somalia to win a gold medal at the IAAF World Championships in Athletics when he became 1500 metre champion at the 1987 World Championships. Mo Farah has also won three World Championship golds and two Olympic golds at the 2012 London Olympics in the 5000 and 10,000 metres. In the martial arts, Faisal Jeylani Aweys and Mohamed Deq Abdulle took home a silver medal and fourth place, respectively, at the 2013 Open World Taekwondo Challenge Cup in Tongeren. The Somali National Olympic committee has devised a special support program to ensure continued success in future tournaments. Additionally, Mohamed Jama has won both world and European titles in K1 and Thai Boxing. ^ Mohamed Diriye Abdullahi (2001). Culture and Customs of Somalia. Greenwood Publishing Group. pp. 109–. ISBN 978-0-313-31333-2. ^ Mohamed Diriye Abdullahi. Culture and Customs of Somalia. Westport, Connecticut, Greenwood Publishing Group, Inc, 2001. p. 24. ^ Mohamed Diriye Abdullahi. Culture and Customs of Somalia. Westport, Connecticut, Greenwood Publishing Group, Inc, 2001. p. 25. ^ a b c d e "A Country Study: Somalia from The Library of Congress". Lcweb2.loc.gov. pp. 96–98. Retrieved 2011-04-27. ^ Ira M. Lapidus (2014). A History of Islamic Societies. Cambridge University Press. pp. 480–481. ISBN 978-1-139-99150-6. ^ a b I. M. Lewis (1998). Saints and Somalis: Popular Islam in a Clan-based Society. The Red Sea Press. pp. 11–16. ISBN 978-1-56902-103-3. ^ Robert L. Hess (1964). "The 'Mad Mullah' and Northern Somalia". The Journal of African History. 5 (3): 415–433. JSTOR 179976. ^ a b Hess, Robert L. (1964). "The 'Mad Mullah' and Northern Somalia". The Journal of African History. 5 (3): 415–433. JSTOR 179976. ^ Hanif, N. (2000). Biographical Encyclopaedia of Sufis: South Asia. Sarup & Sons. ISBN 9788176250870. ^ Lewis, I. M. (1998). Saints and Somalis: Popular Islam in a Clan-based Society. The Red Sea Press. ISBN 9781569021033. ^ a b Martin, B. G. (2003-02-13). Muslim Brotherhoods in Nineteenth-Century Africa. Cambridge University Press. p. 161. ISBN 9780521534512. ^ I. M. Lewis, Saints and Somalis: popular Islam in a clan-based society, (The Red Sea Press: 1998), p.8-9. ^ The Transitional Federal Charter of the Somali Republic Archived March 25, 2009, at the Wayback Machine, Article 8, p.6. ^ According to article 7 of The Transitional Federal Charter of the Somali Republic Archived March 25, 2009, at the Wayback Machine: The official languages of the Somali Republic shall be Somali (Maay and Maxaatiri) and Arabic. The second languages of the Transitional Federal Government shall be English and Italian. ^ Nagendra Kr Singh, International encyclopaedia of Islamic dynasties, (Anmol Publications PVT. LTD.: 2002), p.50. This page was last edited on 27 March 2019, at 23:05 (UTC).